Adaptive custom web design company in India allows you to create sites that can be viewed from all devices with Internet access: from the smartphone to the 27-inch monitor. This design easily allows you to read text without increasing its size, including by developing mobile applications. Why Do We Choose Adaptive Web Design? Many people go to websites from their smartphones and tablets. In connection with the growth of the mobile device market, as well as the development of mobile Internet access technologies, it is expected that the number of website views from smartphones and tablets will significantly exceed the number of views from personal computers and laptops in 3-5 years. A few years ago, the Internet could only be used on a desktop PC or laptop only at home, at work or in special places. Today, for a person to find the product or service that interests him, just get the phone out of his pocket. From experience, we can say that if a person uses a smartphone to get to a site that is not optimized for mobile devices, in 50% of cases a person leaves the site due to the fact that it is impossible to work with, and also to dial a telephone number with one tap. In this case, the owners of such sites do not have a chance to make their client from the site visitor. 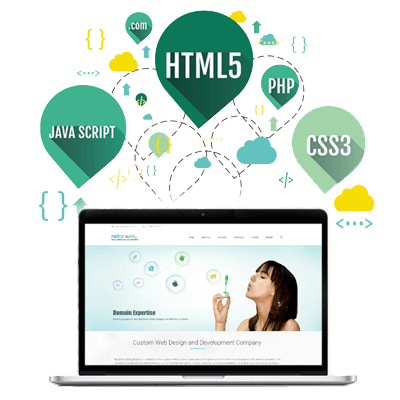 Custom web design services gives you the freedom to create sites that you can actually tailor to any user. Why Choose Us For Custom Web Design? Whenever you have a question, an idea, or just need some advice, our team is here for you. We are always available. We have worked in several industries, so there are no surprises. We are here to complement your team with our extraordinary customized web designing skills. Our goal is to make you happy and successful. Our greatest source of pride is playing a central role in the growth and success of other companies. We take your investment very personally, and as a result, we approach your challenges and objectives as if they were ours. Everything we do is focused on the success of your business. We work with you to improve your marketing plan, overcome your challenges, reach your goals and meet deadlines. When it comes to attracting, turning your visits into customers and quantifying results, there is nothing that is beyond our reach. We develop the Digital Marketing plan for our clients based on their business objectives. We define who the ideal client is and design the concrete actions to attract them.